A journey down the historic River Road between New Orleans and Baton Rouge will take the traveler past romantic plantations, alligator-filled swamps, and a Pre-K–5 school that is “Building a Brighter Future” for the children and the community. A stone’s skip away from the mighty Mississippi River lies St. Rose Elementary School. 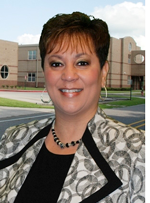 Leading the school is Mrs. Merlyna Valentine, the principal since 2005. This school is one of 18 serving the almost 10,000 students in the St. Charles Parish Public Schools. St. Rose Elementary (SRE) is a Title I school with 72% of the 650 students qualifying for free or reduced lunch. “Building a Brighter Future” is the school’s motto and sets the focus each day for the staff and faculty. And while the road to the future has been just as winding as the River Road it hugs, the steadfastness and determination of the school’s leaders have been undeterred—resulting in academic and social gains. In October of 2012, SRE was labeled a “Top Gain” School by the Louisiana Department of Education for raising their School Performance Score by 8.6 points to 104.6. Contributing to the academic success of the school, they also celebrated their lowest discipline referral rate in over 10 years, with only 89 referrals in the 2011–2012 school year. Merlyna attributes this success to the schoolwide procedures in place that teach responsibility. In 2005, as Mrs. Merlyna Adams, Merlyna was appointed principal of St. Rose Elementary School. In her first year as a new principal, disaster struck. Hurricane Katrina walloped the South and left a path of destruction that swept through most of St. Rose’s neighboring communities. SRE opened its doors and its arms and welcomed over 100 displaced students. With the school year underway and procedures already in place, the staff knew they needed to spend a significant amount of these first days with the new students re-teaching, rehearsing, and practicing the already established procedures and routines. 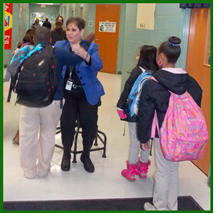 The remainder of the year went smoothly and success was evident as test scores exceeded expectations. A year of stability followed. In August 2007, while Merlyna was welcoming students to a new school year at the annual Meet and Greet Open House, she experienced unbearable pain in her side. She was diagnosed with a kidney stone. But, five days later, she developed sepsis, the body’s response to germs and bacteria that results in shock and major organ failure. Merlyna was given a 10% chance at making it through the night. Battling the odds, she survived and spent the next 90 days in the hospital. One of the possible consequences of sepsis is restricted blood flow. As Merlyna was fighting for her life, the blood flow to her hands and feet was compromised and she faced a new complication. Both of her of legs had to be amputated below the knee and she lost both hands. In the face of such catastrophic loses and the daunting challenges ahead, Merlyna discovered a remarkable inner strength that enabled her to transcend anger and sadness and focus on her gratitude for being alive. She recovered from three amputation surgeries and began the process of getting prosthetic hands and legs and learning to use them. The national director for communications for the prosthetic company says Merlyna’s recovery and adjustment is just mind-boggling. Most people faced with her circumstances have all they can do to just live each day adjusting to their situation. Merlyna, not only adjusted, she has resumed life where she left off and it is all because of her attitude. While Merlyna’s mind was focused on recovery, her heart was getting a strong dose of genuine, unconditional love from her boyfriend, Tory Valentine. He remained by her side throughout the ordeal, sleeping in her hospital room, learning to do her wound care, and becoming her personal makeup and hair stylist. And he would ask her to marry him. But, more on that later! For two years, Merlyna fought to regain her quality of life and learned to use prosthetic hands and legs . . . her goal, to return to the children at her cherished school as their principal. Many thought it would be impossible. Nearly two years after that first grimace of pain, Merlyna walked through the doors of St. Rose Elementary School and resumed her leadership of 650 youngsters and a faculty of 100. With her return in 2008-2009, she faced over 580 discipline referrals. Everyone knew they had to get a handle on this before student learning could improve. Merlyna thought back to her early days as a teacher, when she coached new teachers about classroom management and used our video series, The Effective Teacher. Hearing Harry’s explanation of what effective teachers know and do was replayed in her head. As a principal, she reflected on over 14 years in her own classroom and developed a plan of action. Immediately, Merlyna and her discipline committee decided to combine Responsive Classroom™ with our effective teaching series to establish a foundation for success. establishing a first day script, and generating a list of procedures to teach. 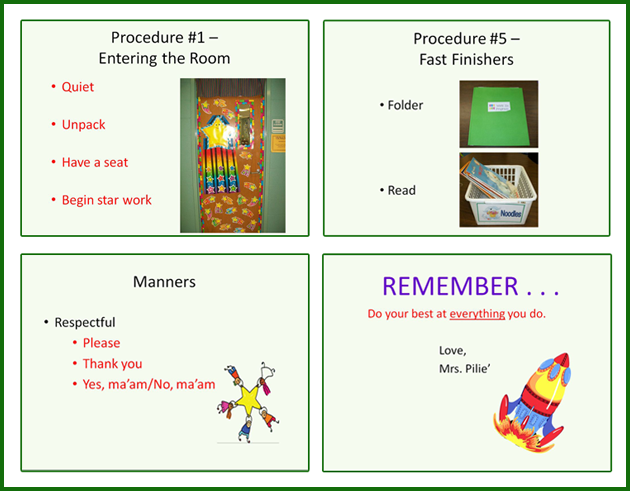 getting students to know the classroom and school procedures. SRE is a family and the procedures created a Culture of Consistency that ensured students were taught, loved, and cared for. The Culture of Consistency is exemplified by Shelly Pilie, who like all of the teachers at SRE, has a plan in PowerPoint ready for the first days of school. Click here to see all the slides in the PowerPoint presentation Shelly uses to present her first day of school plan to her students. Tiffany Landrum also has a first day plan and created a PowerPoint presentation to share some procedures suitable for her classroom. Click here to see all of the PowerPoint slides that she uses to present procedures on her first days of school. All successful schools have a structure that provides a safe, organized, and productive environment, which is what all students and teachers want. This is created with schoolwide procedures. A schoolwide procedure does not mean that every teacher is doing the same thing. The concept is universal; the practices are not. For instance, an opening assignment is universal, but every teacher has his or her own bellwork, warm up exercise, daily oral language, quick start, do now, or whatever the teacher wants to call it, when the students enter the classroom. This is best exemplified when you watch a winning sports team. Every player is an individual, but they play as a team. 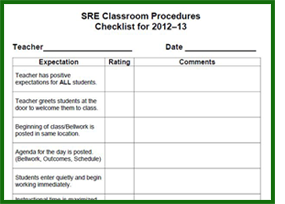 As one walks the campus of SRE, there are procedures evident all around the school. Merlyna and the teachers greet the students at the start of the school day. Merlyna is at the entrance and she personally welcomes all students. She also says goodbye to students each afternoon. She sets the example for teachers, as it is an expectation for teachers to greet every student with a warm smile and sincere hello. Merlyna and her three assistant principals make it a personal mission to know every child’s name and visit classrooms daily. There is a procedure for properly walking the hallways. There is a procedure for students to responsibly take their own attendance. There is a procedure for lining up. 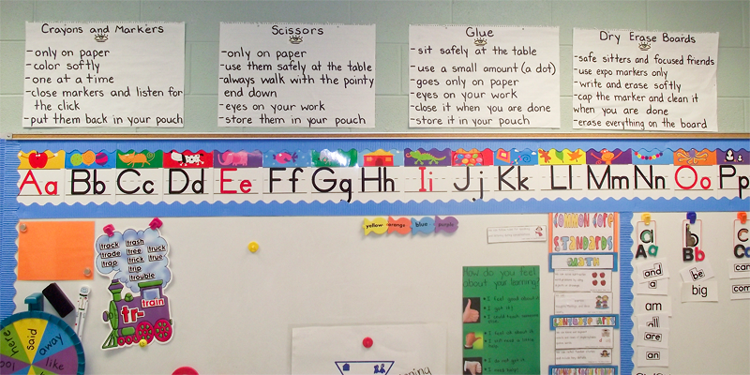 There is a procedure used by Kristen Wiss to let students know the proper use of classroom supplies and materials in the classroom. 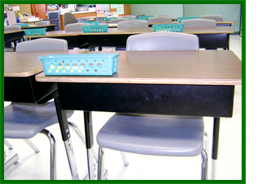 Katie Fitzsimmons, a fourth grade teacher, has a procedure using teal-colored bins Velcroed onto the students’ desks. She observed students constantly digging in their school bags or pencil cases to find supplies. With these bins, all pencils and materials are placed in the bins in the beginning of class so no class time is wasted trying to find materials. Agendas start the school day and procedures are integrated with the academic instruction so students see the benefits of having procedures in place. They know that following procedures can lead to their academic success. 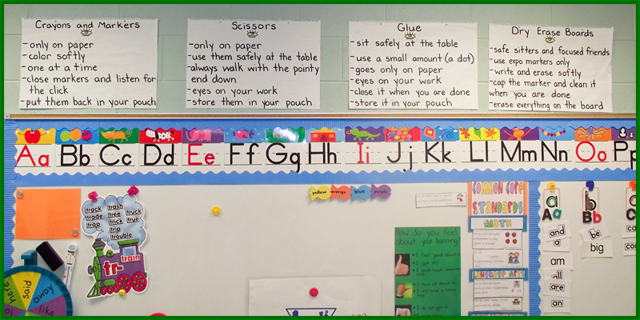 The buses, cafeteria, playground, and restrooms are included in the explicit teaching of procedures. Students see posters in these areas with schoolwide expectations. A consistent, firm, and loving environment permeates through the halls of St. Rose Elementary School. The faculty and staff continuously work on fine tuning the procedures and discipline measures used at the school to increase their effectiveness. 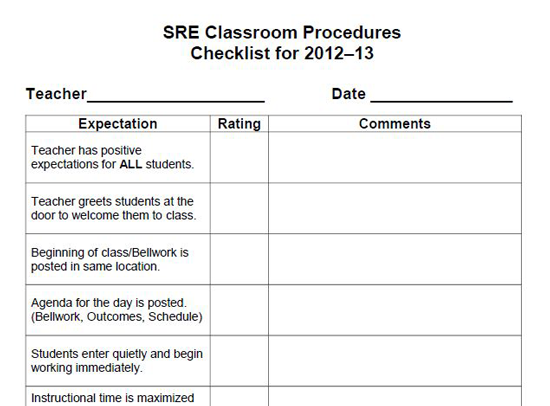 The administration uses a checklist to monitor the consistent use of procedures and discipline during classroom visits. 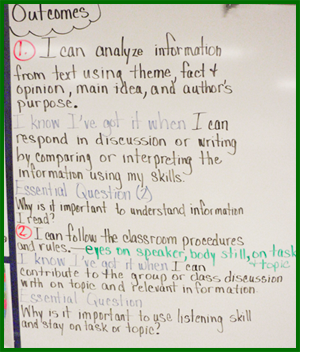 Each month, professional development revisits the schoolwide procedures and allows teachers a chance to self-assess their effectiveness with the one-page checklist. The information is gathered and used to plan additional training and support. Click here to see and download the complete checklist. At SRE, there is an ongoing culture of high expectations and consistency that produces a positive school climate. You can see how SRE is “Building a Brighter Future” for all of the students with the consistency that has been developed over time. Besides creating a safe and caring environment for the students, the faculty and staff create excitement with a schoolwide theme for the year. 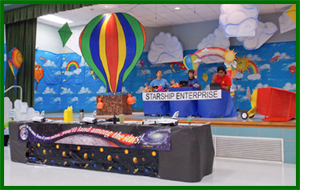 This year’s theme is “Soaring to New Heights.” The school year started with a big reveal that included staff in character to explain the theme. They came as astronauts and pilots and other costumed figures. It created such energy and excitement for the staff and the students, with only good things to follow. The staff, in costume, took the time at the start of the year to explain the theme to the students and how procedures would lead them to new heights in learning and achievement. 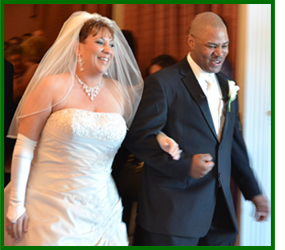 On April 16, 2011, Merlyna walked down the aisle and extended her beautiful, prosthetic hand in marriage. The diamond on her left finger sparkles as brightly as the love for life that Merlyna models and lives each day. In the face of inconceivable adversity, she is a pillar of strength, character, and joy. Click here for more of Merlyna’s personal journey. We often say in our talks that the effective teacher knows how to adapt a technique to make it work in the classroom. Merlyna and her staff knew that they had to adapt proven techniques to bring success to their students. And it’s working—with great success. With Merlyna’s heart and desire, the possible has come true—in her professional and her personal life. Her passionate leadership has steered SRE to building a brighter future for the students. And her adaptability has created a world of love and possibility for her. Her story is an example of fortitude and perseverance—to look adversity in the eye and say, “Not me.” More on her determination and attitude can be found here. You will come away awakened with the attitude that everything is achievable with heart and desire. We visited St. Rose Elementary School last month as part of the research in writing this column. It was hard to say good-bye. The school exudes effectiveness—with a capital E! The processes and accountability in place to make sure every child makes gains are concrete and not jargon. The faculty and staff are diligent and relentless in improving on what is already in place so children get the best education to be found anywhere. To walk the welcoming hallways, to observe skillful, targeted instruction in whole group lessons or one-on-one instruction, to interact with parents, staff, children, teachers, and district office leaders and feel the genuine pride they have in this school, and to have the best red beans and rice for lunch—WOW—what a day, what a school! Merlyna Valentine, you and your faculty and staff make our hearts soar with possibility!